Weekly updates, more for my benefit than yours, on what we’re focusing on during training and how that’s progressing over time. I’ve been doing tunnel games maybe twice a week. She seems to really enjoy these, and I get to throw in a little bit of handling stuff as well, which she needs. I think my next goal with the tunnel games is to either do 2 curved tunnels (but this is so much more effort to set up) or start adding a jump, then another jump… into the game. Because I see her driving really nicely into the tunnel and especially out of it in this scenario, but start doing a sequence and that same drive isn’t there. So I think we need to do the tunnel games and start sneaking in obstacles so she can learn that she will get to chase the ball, after this jump, or after 2 jumps, 3 jumps, etc. After another month or so, I guess, I want to do some DW speed circles. At the moment she’s done 2 full DWs, and one time when she didn’t want to do it. When her fitness is up a bit more and she can actually run them full speed again, speed circles in and out of tunnels and stuff with the DW in the middle would be really fun. Tricks we’ve been doing include: lots of sit pretty, especially on a big couch cushion. Interestingly, I’d say her ‘sit pretty’ stamina is almost better now than it was before the surgery. Go figure. Today I just started playing with the ‘hold the toy’ trick which will help as well. We’ve also done lots of sit pretty – stand up – sit pretty. She’s good at this! The only thing I want to work on here is the sit pretty – stand up part, because she has trouble standing straight up and steadily. Lots of sit pretty – drop – sit pretty, but these have always been easy for her. Side legs on both sides, and handstands against a cushion vertical on the wall… I’m going to start getting her to do these quicker, so she has less time to think and ‘climb’ up, and I might start to get the ‘hopping up’ behaviour I want. Sometimes I get her up on the fit ball, but not often. Then, I’ve been getting her to get all 4 paws up on the not-so-narrow edge of our couch, and interestingly, she finds this surprisingly difficult. I actually think it’s a MUCH better balance workout for her than her 4-in a bowl. Whether the bowl was too small and her feet were all squished and she couldn’t actually hold the 4-in for more than 2 seconds, or just because I didn’t train her well enough to hold it for more than 2 seconds, I’m not sure. But on the couch, I can see her really working to stay balanced, and her feet are more or less in the same ‘4-in’ position. Once she’s more confident and strong doing that, I’ll move her to a narrower edge of the couch. Meanwhile I have an ‘instant-nose’ trick, where if you ask her to sit, she’ll also start offering the ‘hide your face’/shame trick that she hasn’t quite mastered yet, and basically results in her punching herself in the face. It’s kind of adorable and hilarious. We’ve also been trying to go for walks and runs where we can, but it’s very weather dependent. I don’t do well in warm weather (as in, I’m not going to go for a jog when it’s warm), and any time it’s vaguely sunny we can’t really do any bush-type walking because of the snake factor (like this morning would have been perfect), but we have done a couple of walks with Penny and her dogs and Lu tries her best to keep up but isn’t quite there yet. But, the other morning we’d been doing a tunnel game and a man came along and asked if he could walk his dogs on the oval nearby, which was nice of him to let me know (he thought I had 3 dogs as there were 2 randoms from the nearby camp hanging around) and since Lu has been ‘guard barking’ anybody who dares enter ‘her’ park, I figured it would be a good idea to go down and reward her for not barking, and for nice calm behaviour. As I came down I saw he had kelpies (3) and an old BC, and they were running so I let Lu off the lead and off she ran. Turns out he’s a herding judge who knows Lu’s breeder well, and whose dogs have competed against Lu’s sire. Good part about this is that with a whistle, he can send his 2 experienced kelpies racing off around the circumference of the oval, or away from him, or whatever, and Lu gets to go charging after them. He also has a young pup who she played chase with the other day, and as the pup gets older there’ll be better games of chase cos she’ll be able to keep up. So Lu’s been able to run with them about 3 times now and I can actually see her old stride coming back, she’s able to run for longer and look almost as fast as she was. That’s why I’m calling it ‘kelpie therapy’, because she’s getting some wonderful sprinting in with them. Meanwhile still doing weaves when she seems excited or like she wants to run around or play with me. Keeping it nice and short unless she’s having trouble with an entry or something, in which case I keep upbeat and keep trying, and have a huge reward when she gets it (or… nearly gets it, like yesterday), and then do a really easy fun and fast one, and then call it quits. The poles are open about 10cm still, but I’ve been wanting her to find her rhythm, and the session before last I saw it- she wasn’t randomly smashing through the bars but she was getting into that one-foot motion and looking fluid. I’ll give her another two or three sessions on this width as I still need to go from the opposite end, but I’m feeling pretty good about her progress. Here is a video of what was essentially 45 minutes of running dogwalk. I know, it was WAY too long. Like, WAY WAY too long. And by the end she wasn’t running at her normal speed but at the time she felt fast and we were actually having some successes and she was still keen so we kept going. At one point in the first session I tied her up for a break and she literally yelled at me to keep going. HUH?! Loved that. So I ran Mal, then I gave her another go. Silvia says I’m allowed to stay on this height and keep trying what I’m doing since there’s some improvement now. Jeez I hope every height change isn’t this hard. I found that putting the jump at the end of the DW seemed to help as she’d started curling back to me to check for a reward in the 1st half therefore GETTING good hits but only because she was slowing down to turn. The jumps she did were pretty shocking so I need to remember to take the bar off so it’s just a 5cm bar and she doesn’t have to worry about ‘actually jumping’ it. Then there’s a cute little video of some serps. We started with it fairly open, but she was working so, so nicely that I figured I’d see what she did when I closed it, since we have done it before. There’s a super adorable one there where I just wanted to practise a turn out of the straight tunnel, since the try beforehand she blasted out and continued forward… So I turned her out, got her over the jump, threw the frisbee then watched in amazement as she did the rest of the serpentine before going to get it. This girl’s obstacle focus is continuing to amaze me. Sometimes I start her on the DW at some point and she’s STARING ahead. I think she’s staring AT something, but there’s nothing there, she’s just staring ahead for the ball. Holy crap. Without intentionally teaching it, she seems to set up in a stay, look at me for a bit, then stare ahead. Good girl. Lu has been learning to jump. I’m learning about what makes her do weird jumps, like if I throw a toy too late (she’s bouncing trying to see it, and looking way ahead at the TOY and where it MIGHT land, and not at the jump in front of her so she takes of REALLY EARLY because she’s not looking at the jump), or possibly after we’ve done a bunch of cik/toks where she tends to bounce more and then we do an extension jump…? Or POSSIBLY (and I’m about to see the video to confirm) if I don’t give her enough info about where she’s going. But maybe not. I’ll see in a bit. I think so, yes. But she’s adding in an extra stride more and more often now in order to set herself up better for the bar, and is starting to extend those back legs. Yay!!! She is super funny, super cute and super naughty at the moment. But it’s way too cute for me to care. Just before, she brought me the packaging of a texta that she’d found and basically shoved it in my face. Too cool. She’s running so, so nicely. She’s fast and focused, even when she knows there’s rabbits in the paddock next door, or a Badger sitting near by (Badger the dog not the animal). I’m learning to ‘let go’, and it’s actually a lot easier than I thought. I’m laughing off broken stays (she’s good at them so I’m not worried) and rewarding for effort even if there’s a knocked bar or something. She’s trying so hard and I don’t want to reinforce these things but I’m not going to squash her beautiful enthusiasm by being all serious. We did some weaves for the first time in ages today. It’s ALMOST at the point where she has to start MOVING to not crash into poles. She had to wiggle herself at the start because they were a little wonky but when I straightened them up she could just run though. I’ll work on entries there for a little while then narrow them up again. We’ve also started doing more happy tricks before running a little sequence. These are “chomp”, speak, bounce up, back up (she looooooves this one), spin right/left, heel sometimes, or just get into heel position (she loves throwing herself against my leg, too cute), and we’re starting to do jump over the leg. She seems to like it, I think. Oh it’s so fun and I love running with her right now and seeing her fast little running, and seeing her work out how to jump like a normal proper dog and remembering how to turn and starting to like curved tunnels a bit and stuff. Here’s a video. It’s 80% jumping in a straight line but since that’s much more important to us, both in terms of her jumping style and Australian courses (I think you don’t ever get wraps, like ever) I’m going to keep doing it. I realise it looks like the same thing over and over and I guess in a way it was but that’s ok. This photo seems like SO LONG AGO. We’ve come so far in such a short time. I need to remember that. So… not overly helpful. BUT… it did make me really, really appreciate how amazing Lumen’s forward focus actually is. Watching her nearly trip over her dog several times from it turning in and getting underfoot, I just thought- YES! Either Lu is either always behind and racing to catch up because I can show and go on a wrap or run off on her while she’s in a tunnel, or is driving forward. Go Bean! She was super speedy though, having a new dog and person to watch her, but worked really nicely. Responsive and moving well. We did a couple of sequences with some challenging bits- tunnel discriminations, wraps from weird angles, serpentine-bits, and she had a good try at everything. I’ve closed my weave channel to 40cm now and so am working around the entries again- I really need to make sure I do both sides though as I’m certainly favouring the left. We also did just 4 RC runs – the first 2 were messy, and the second 2 were BEAUTIFUL. I decided not to jinx it and do any more at that point! We hadn’t done any RC in about a week since I got depressed about not having an up plank and haven’t had time to build one. One of the kids at school asked me today which dog was my favourite and you know, they’re like kids- they have things about them that you like, and things you don’t, but you don’t have favourites. I think I’m coming to terms, though, with the fact that Lu isn’t Mal, and won’t act like Mal, and therefore mightn’t be the “dog I thought I wanted”, but I so love working with her and playing with her… and I love seeing her serious, serious little face when she’s waiting for the release word, when I say “ready?” and her face says: “I was born ready…” (I need a photo of that face), and trusting her I think more than I would have trusted Mal for a lot of agility things and being constantly amazed when she does those things! And her jumping issue is still super worrying and I feel like I’ve been training a lot less lately because of it, but hopefully with HGR and time she gets over it and becomes a normal dog who can jump normally! Anyway, I like her a lot and we’re having super fun happy times. The end. Oh, and unrelated, I’m holding my first agility class at The Field next Wednesday. So far I only have 2 people coming, but I don’t mind, it’ll be fun in any case and Lu can come out and play, too. 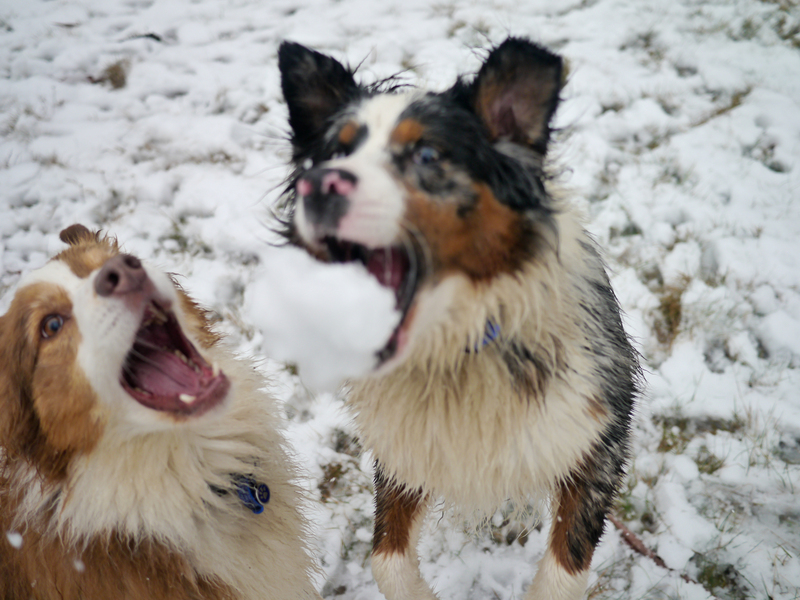 I don’t have any movies or even any new photos for this week so here’s one of her catching a snowball because we might be going to the snow again this weekend. Nothing deep and/or meaningful and/or insightful for you at the moment. School’s just gone back and as always there’s a period of readjustment where I try and overcome my school fatigue to write stuff here. I’m meant to be writing up a performance review thing but it’s long and arduous and I can’t be bothered but I need to find time before tomorrow… so, that’s thrilling. -lots of ‘race to the toy’ game inside. Lu is beginning to REALLY get this game (finally) and will blast out ahead of me and dash to the toy. I think the two times she didn’t beat me and I grabbed it and played merrily by myself taught her never let that strange woman win. And she hasn’t since. -HGR games. I won’t really say too much about them because I respect the fact that they’ve come up with the exercises and such, suffice to say that one of the games is going to make teaching weaves SUPER AWESOME, and another of the games is going to really help with her adjusting her stride in RC. -Speaking of, RC is on hold for a while until I either a) get my own dogwalk (not likely until back from Honeymoon) or b) buy ANOTHER long plank, nail it together and use it as an up-ramp. The flat-plank to down-plank is at such a length that if she runs it properly, her stride carries her off the contact zone. Sigh. -Started working on weaves a bit again. 40cm now. Beginning entrances from 12:00 around again. =Been running some fun little sequences and speedy things with no bars. Did an AWESOME one the other day that originally I did a ‘tok’ turn as a post/shoulder pull turn, sending her into the nearby (and very tempting) straight tunnel… tried it the next day as a Kestchner and it was sooo goooooooodddd… Didn’t even look at the tunnel, AND, unlike with previous front-blinds, didn’t get confused about where to go next (possibly also because I was much more decisive about my next move than the first time I tried where I was all like AHHH I TURNED AROUND AND SOMETHING HELP I’M LOST).. Love that move. Gonna be so awesome in trials. Oh yeah. -Doing some bounce-jumping and set-point exercises. In fact, I did a set-point exercise the other night (just stepping into a space from a sit, then pushing over one jump) where instead of her pouncing onto a dead toy (even if it was far from the jump), I rolled the ball… and.. HELLO EXTENSION JUMPING! Back-legs went out, the arc was nice! Ah ha! She still can’t bounce-jump 4 jumps- she’ll do 2, and then leap over the last two without a bounce in the middle UNLESS I send her ahead- if I do a lead-out, she leaps the last 2. Too excited? Maybe. -Teaching her to free-stack. Yup. Cos, y’know, I’ve entered her in a show in 2 weeks time. And, y’know, after some fiddling around, she can actually do it….! Amazingly, she kind of gets the concept that if I do something just right, she needs to keep her back-feet stuck to the ground, and I can move her front feet wherever I want. Woah! So I’ve actually had her stack nicely (well… maybe?) a few times for me. 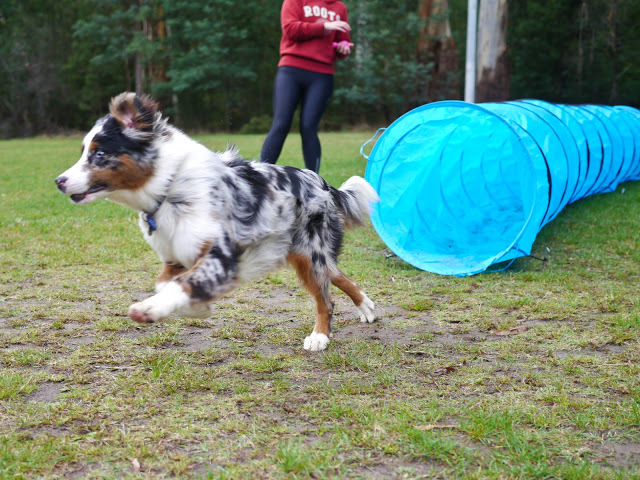 Now I need to study pictures of Aussie Shepherds to see how far back or forward her legs are meant to be. Maybe she won’t do as hilariously bad as I thought…??? No videos for a little while, sorry! Been slack, just been mucking around, not necessarily ‘needing’ to film anything of late. I’ve been really enjoying getting Mr. Mal out for a bit of a play lately to give Lu a break in the crate. I’ve been starting his weaves again for better entries and independence, and running contacts too. When I tried doing some RC yesterday he did a few OK ones on the new height and then jumped off the last two, but, I suspect he was quite sore from the 5 hour hike in the bush the day before so I didn’t fuss about it too much. I’ll try again on that height tonight or tomorrow and if he still jumps, go back down. I’ve also been doing cik/tok with him, and amazingly I’m seeing an improvement in his understanding and his commitment. He’ll still pull of the jump WAY easier than Lu, but she’s actually had heaps more practise at this than him. But, he’s starting to get it. Today I did some figure-8s through a straight tunnel and I was showing and going, and he really surprised me. Go Mal! Lu was getting all crazy in her crate (FOR ONCE!!!) I think she was a bit jealous that she could hear me going: “CIK CIK CIK CIK!!! !” and she wasn’t able to play the game. I took her out of the crate after this and she worked really, really nicely. With Lu, I’ve begun doing ‘pushes’ over the back side of the bar. I’m calling it “Push” because although I wanted to use the command “back back back” this already means ‘backup” and “out” will be for distance, so push it is. Amazingly, she kind of just… gets it.. I think because she’s so new to jumping, if I throw something like this at her she’s like: Oh… you want me to go around and then jump? Sure thing, makes sense! Your body-language is saying it, so why not? Where as, Mr. Experienced Mal is all like OMG FREAK OUT MUST DO THE NORMAL SIDE OF BAR….!!!! Today I had Lu come out of a tunnel, stepped in, pushed her over the bar (umm, she was coming at it from its side, so not straight on yet) with my body-language and drew her over, all in motion, and she did it! Twice! The 2nd time she thought about running past the bar but decided she wouldn’t. Clever girl. I’m just so surprised at how effortlessly she seems to have gotten this idea. Feels like I’m doing it wrong, but hopefully not…? I had her do 3 serpentine bars and she’d been having trouble with the third… when she went over it I looked at her to reward her and I saw her eyes and face looking forward to where the next obstacle was. OBSTACLE FOCUS!!! Good girl!!!! It was super cute, and super awesome. Meanwhile, I have Lu now running on the flat plank, sans carpet. I had to do a heap of free-shaping on it first so she would realise that she wouldn’t plummet to her death if she stepped off it, and then I gradually removed the wider piece of carpet. She’s running beautifully now, but I’m quite worried about when we start getting any height. She’s not so confident on high things. Tree trunks are ok (they’re solid), park benches not so much, bridges are crossed with concern, being on rocks is terrifying… so now every time I see rocks or tree-trunks or park-benches, I get her on there and do some tricks or walk back and forth or whatever. Just getting her confidence up to be ON things. In the meantime, since it’s holidays, I’m planning to do some kind of long walk or hike every day for the next 2 weeks if I can. Today we went for just under 2 hours, 7km. Bit slower than normal but some of the track had a lot of tree branches and tree trunks, and so it was hard going, plus I had to stop and take lots of photos. That’s my excuse, anyway. 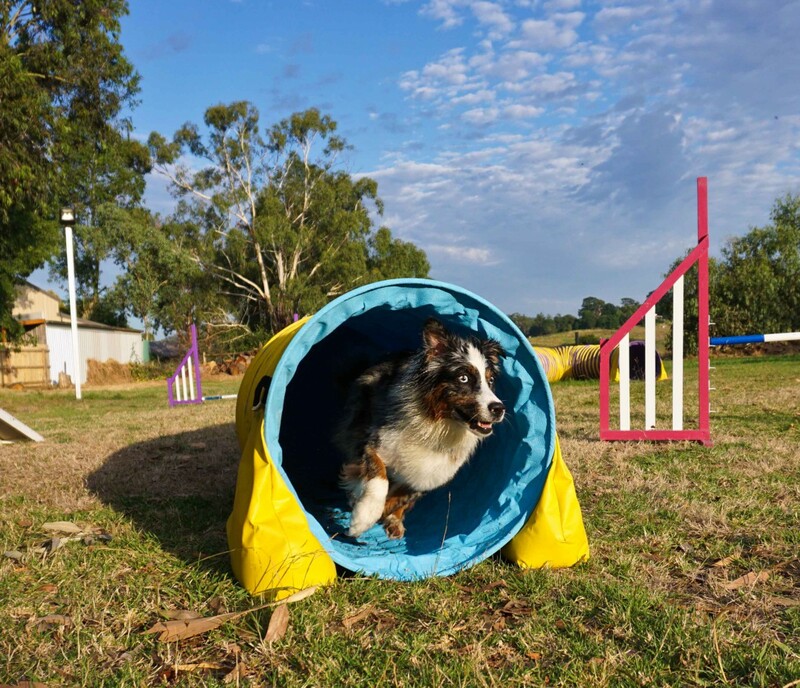 Lu and I have been having super-fun-times at the agility field lately, but I feel like we’re slightly unbalanced, and we’re repeating things we love and can do well and missing out on things that need work. For example, we’ve been doing lots and lots of extension/collection exercises in straight lines, and also lots of serpentines (and working out kinks with them as they appear) but then I noticed that if we’re doing a sequence and she needs to wrap and I can’t ‘show and go’ (show her the wrap and run off) she slows right down as if to say: uhh… why are you standing around? When in fact I can’t move because I need to be there for some reason. So this week, we’ll be working on those little sequences from our foundation course, but actually breaking them down into 2 or 3 jump sections, and rewarding, possibly from hand, after those parts where I have to stand still. Hopefully this will help her understand that it’s just as fun to do those wraps cos you get to play, as it is to do the ones where we keep running all the time. I’m also going to go back to playing the ‘race to the bowl’ game. Our weaves have been pretty meh lately, but I think that’s in part because I don’t have a consistent reward system with her for that yet. With the ball she gets too obsessed and forgets the job, and she doesn’t race to anything else. So I might play race to the food a bit this week on the flat, and down a straight row of weaves. Lots of repetitions of that should build a good base so she is confident of where the reward is, and hopefully gets there with speed. And if not, I’ll pretend to eat it by myself. And if she does a good fast one, she can eat it and then we’ll play. I think in our Foundation Class we’re going to be working on doing the back side of the jump- something Mal was always so useless at. I think I’ll use the word “Push” and I’m excited to give it a try. Possibly it’s threadles, and I’ve always hated threadles (again, Mal was no good) so it would be so lovely to have a dog who could do them, and do them well. I’ve also been working on a little side project, but I need to speak to the woman who owns the land my field is on before I unveil it (Hi L! If you’re reading!). And I revamped the blog a bit. Not sure if it’s the ‘final version’ yet, but I’ll keep tweaking.